1. 3/4 cup chocolate chips. 2. 60 grams low-fat butter. 4. 1/2 teaspoon vanilla essence. 5. 1/2 cup whole wheat flour. 6. 1/4 cup refined flour. 7. 1/2 teaspoon soda bicarbonate. 1. Preheat an oven to 180°C/350°F/Gas Mark 4. Grease a baking tray. 2. Place the butter in a bowl and cream it. Add the egg white and vanilla essence and continue to cream for some time. Set aside. 3. In a separate bowl, sift together both the flour, soda bicarbonate, and salt, fold into the butter mixture and mix well. 4. Add the sugar, walnuts and chocolate chips, reserving a few chocolate chips and mix. 5. Divide the dough into twelve equal portions and shape each into a round cookie. 6. Place the cookies on the greased baking tray keeping enough distance between each. 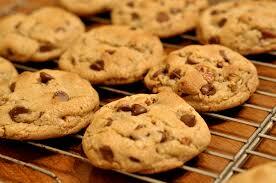 Sprinkle the remaining chocolate chips on top and bake in the preheated oven for twenty to twenty-five minutes. 7. Remove onto a wire rack to cool before serving or store in an airtight container. Despite few disadvantage of chocolate, it has many health benefits too. Let’s see some of these benefits of chocolate. The biggest benefits of chocolate are it boost your brain memory. According to one study drinking two cups of hot chocolate a day may help keep the brain healthy and prevent memory decline in older people. One more study proved that chocolate provides potential benefits of lowering cholesterol levels, preventing cognitive decline, and reducing the risk of cardiovascular problems. It is also proved that dark chocolate increase HDL and protects LDL against oxidation. It also provides the benefits of reducing insulin resistance. Therefore, it protects from heart diseases and diabetes.